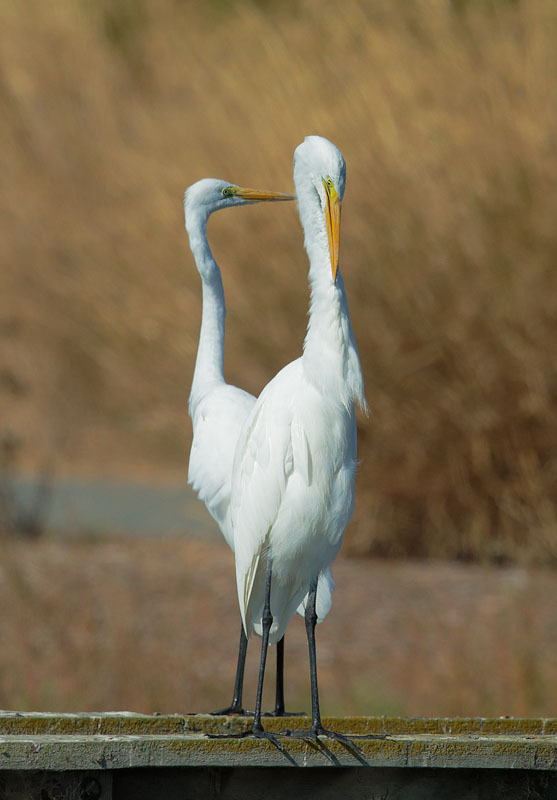 During their breeding season, Great Egrets of both sexes grow magnificent plumes ("aigrettes") which the birds erect as part of their courting displays, see above and below. 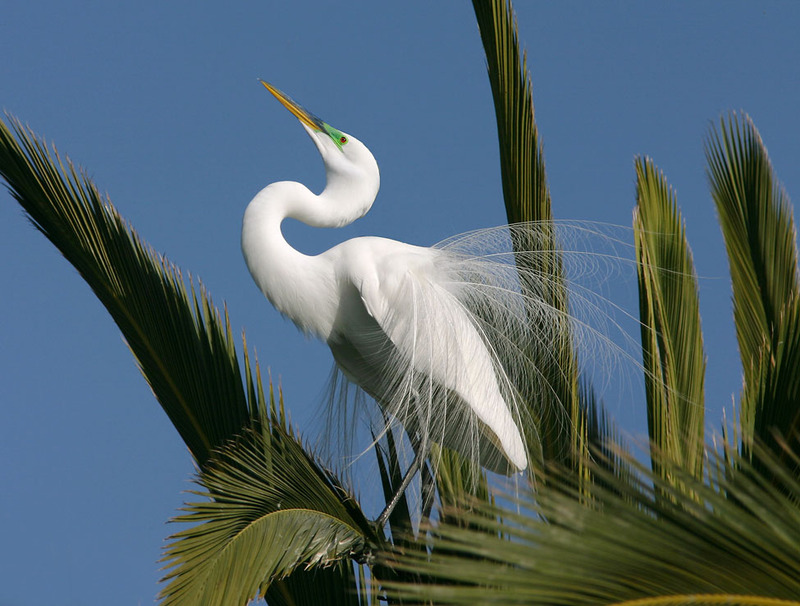 In the late nineteenth century, egret plumes became fashionable decorations for women's hats and clothes in America and Europe, resulting in the species being hunted almost to extinction. 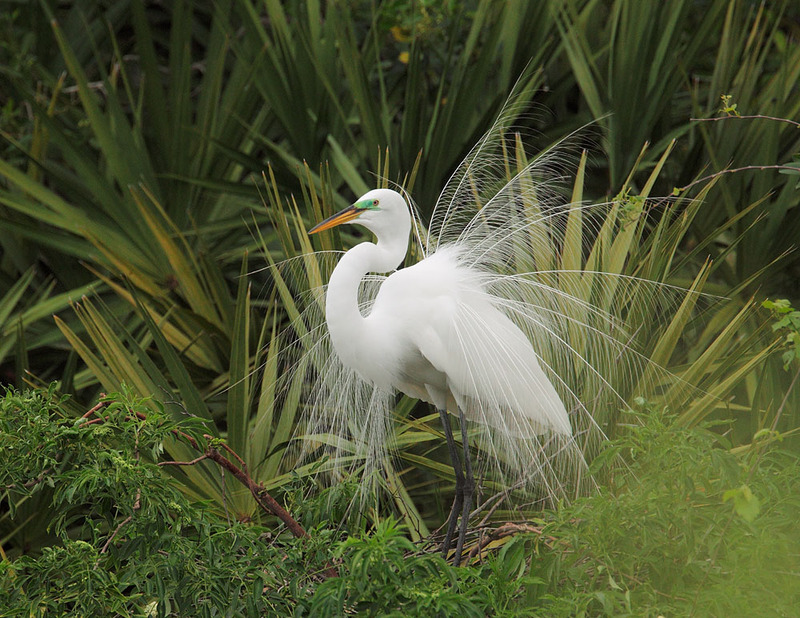 In the U.S. this led to the founding of the Audubon Society (whose symbol to this day is the Great Egret) and to laws prohibiting the sale of bird plumes, beginning with the New York State Audubon Plumage Law in 1910 -- among the first examples of bird-protection legislation. 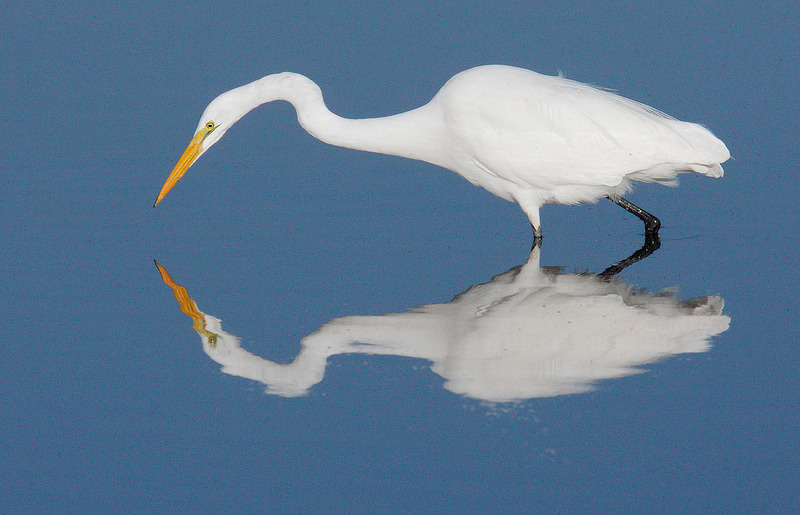 Today, these beautiful large herons are a common sight at wetlands around the world. 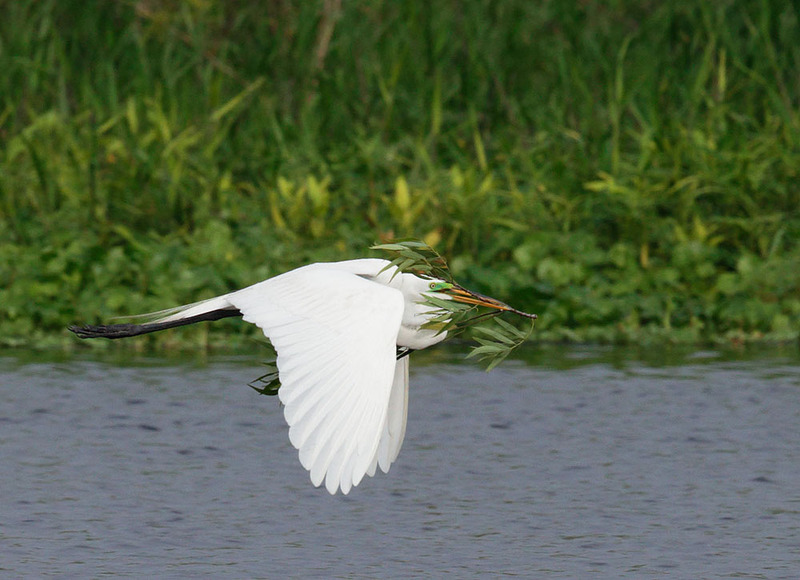 Great Egrets in flight, above and the next two down. 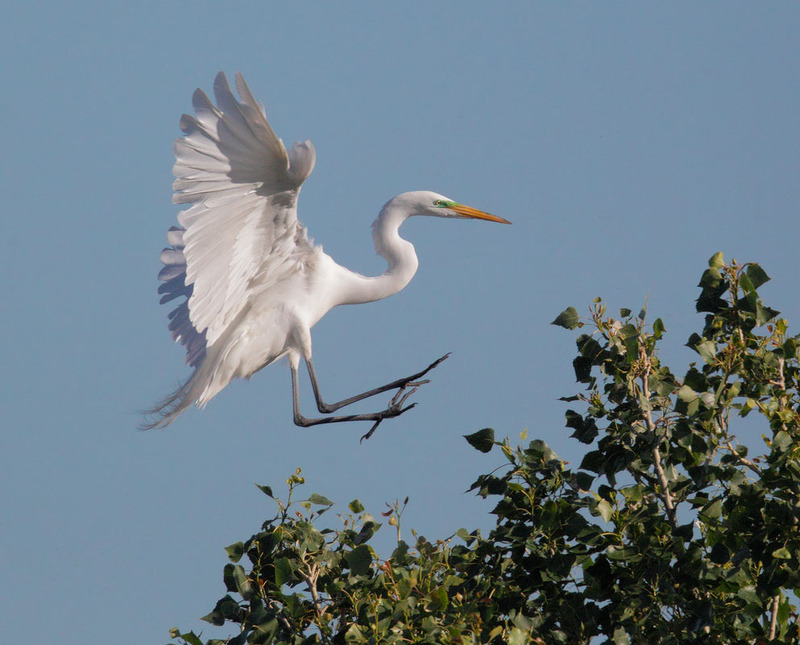 A Great Egret carrying nesting material, above; landing, below. 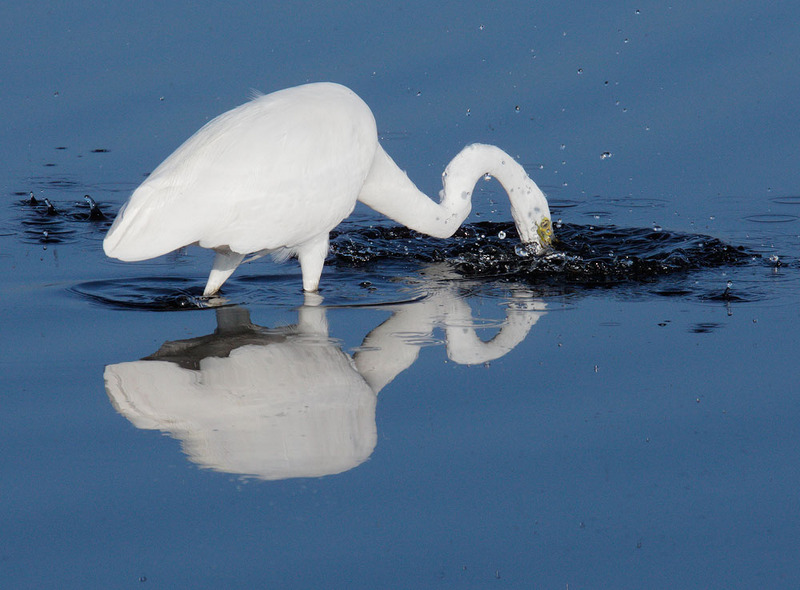 A great egret stands still watching for prey. 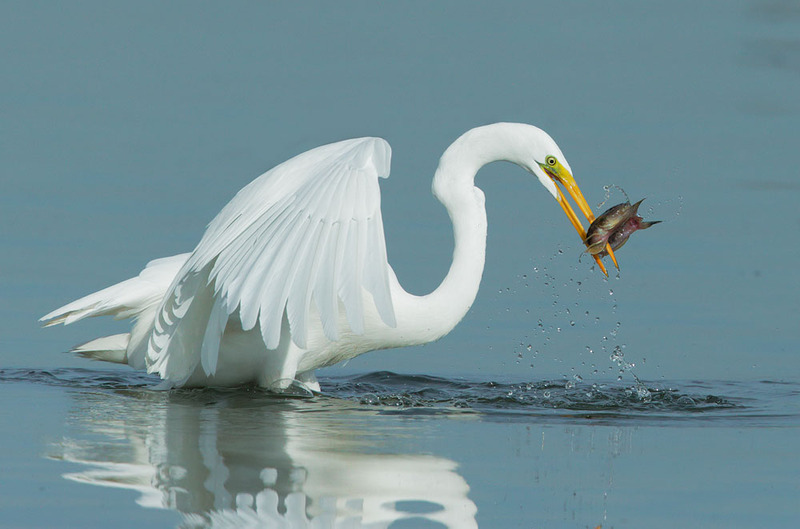 Above, the same bird strikes; below, the result of just such a strike, as a different bird shows a captured fish. 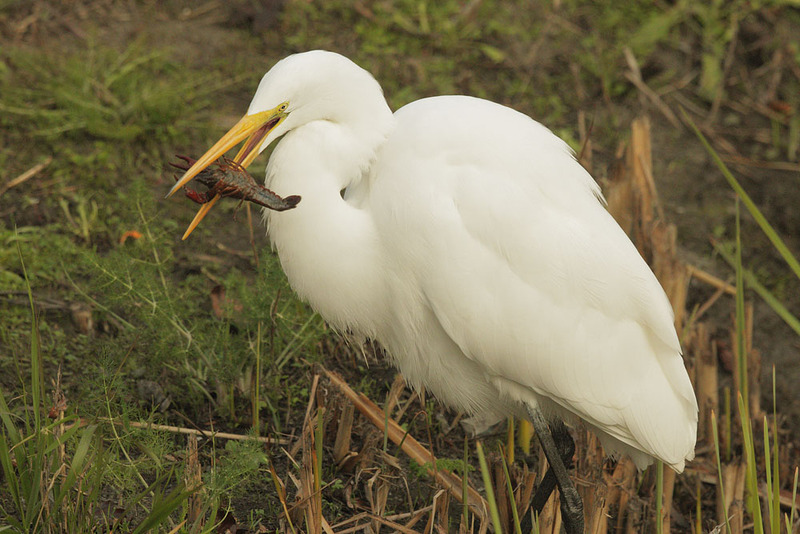 A holiday feast on Christmas morning, 2017: a crayfish. 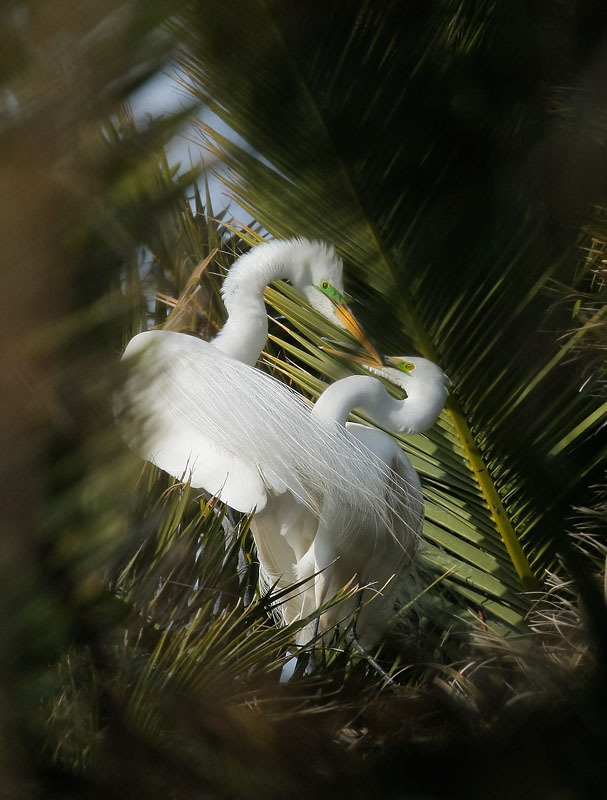 independently of each other as they looked for prey in the water below them. seems likely to be coincidental. 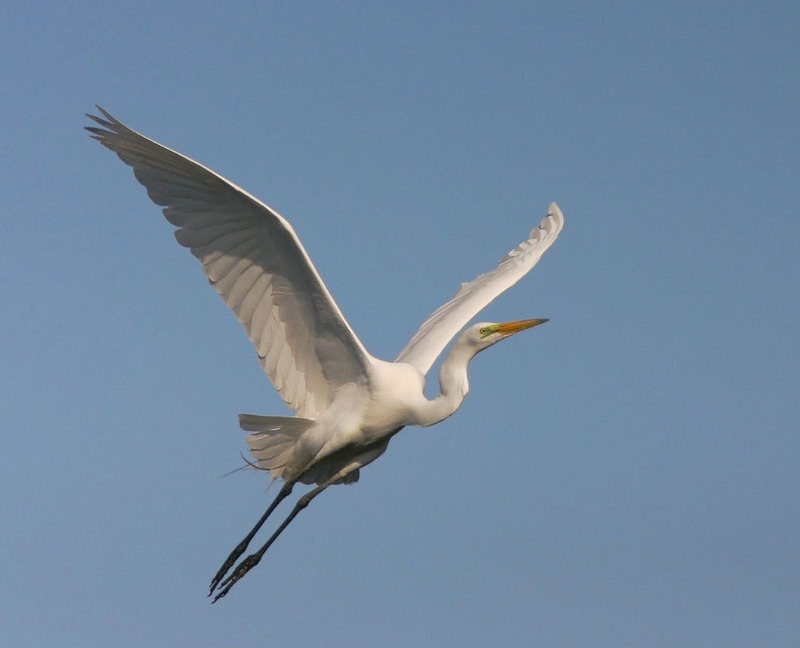 Above, a male passes a stick to a female as the pair builds its nest. 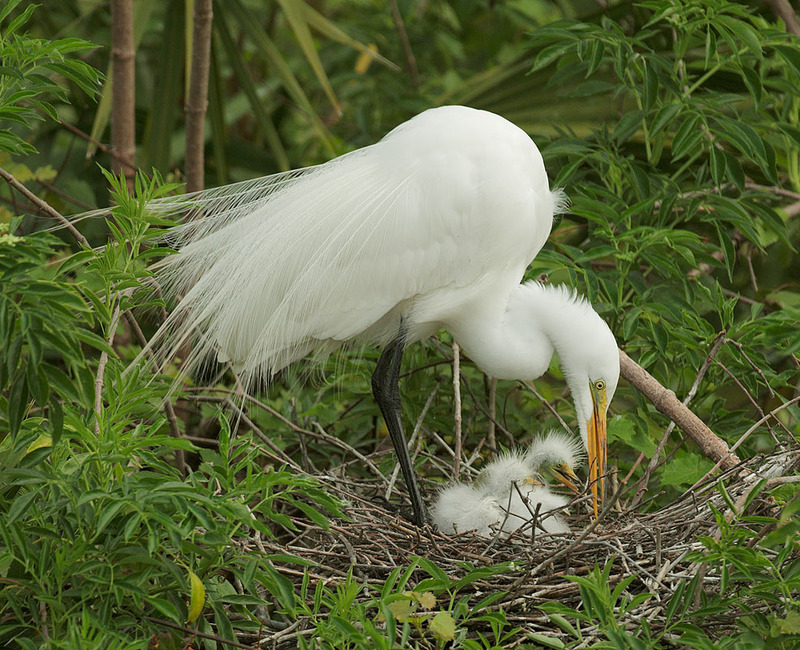 Males construct a nest platform by themselves, and after a female is attracted, nest construction often proceeds cooperatively, with the male gathering most of the nest material while the female mostly works at the nest site. 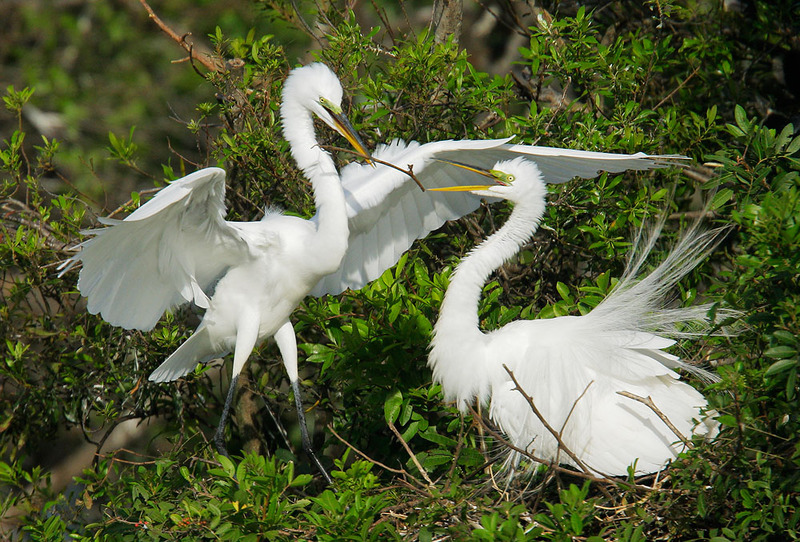 Great Egrets have an unusual practice in which, after an initial courtship and copulation at the nest platform, the pair joins in further nest construction and territorial defense on a trial basis for up to a week, during which time up to 20% of the pairs separate. 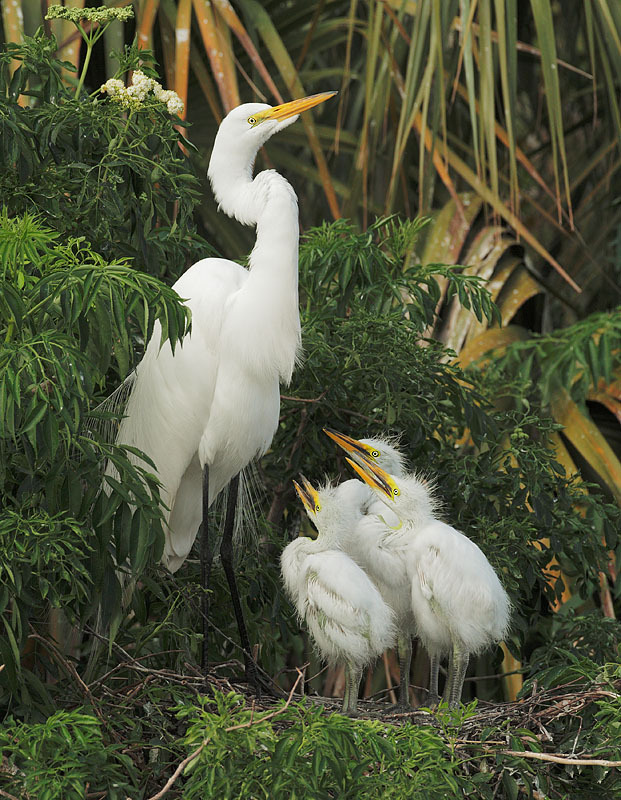 Thereafter, the pair bond is established and the birds proceed with the laying of eggs and the raising of offspring. and brighter patch of green bare skin on the left-hand bird suggest that it is the male. This chick has just emerged from the broken blue egg; the adult brings a large insect, perhaps a cricket, to the nest in its bill. 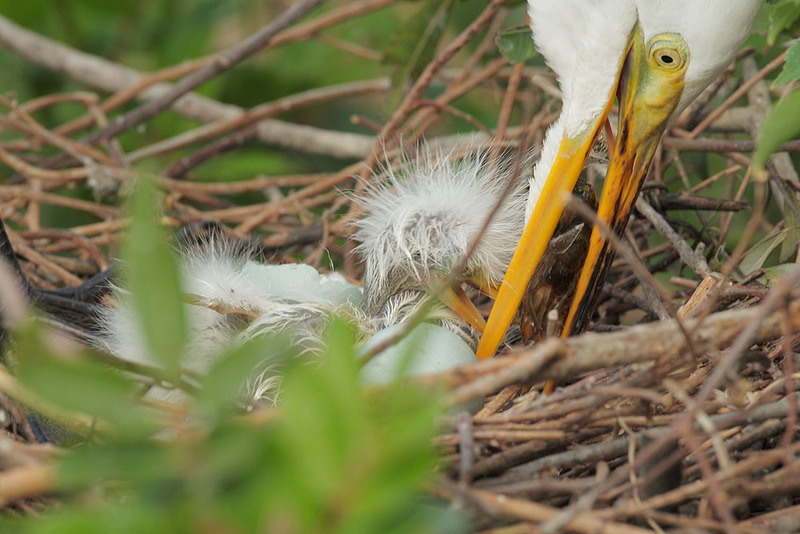 Adults with small (above) and medium sized (below) nestlings. 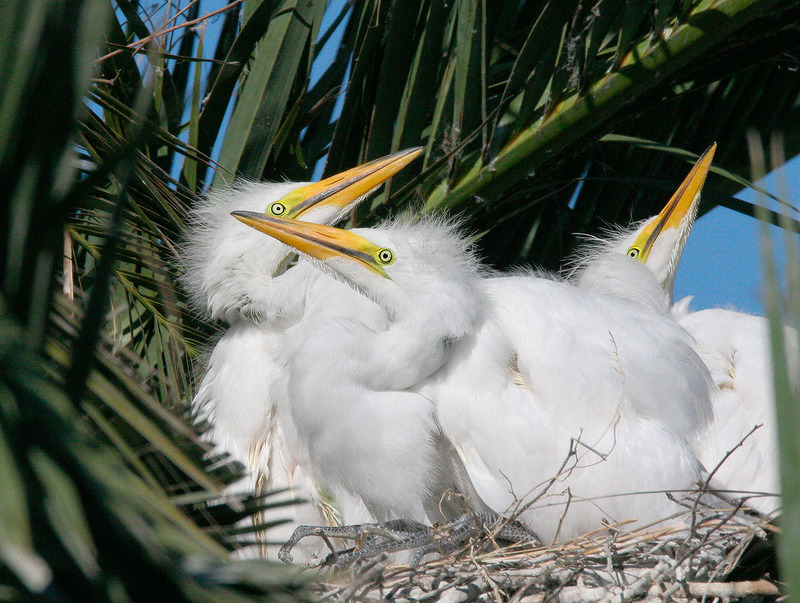 Three large nestlings, with well-developed juvenal feathers replacing down, sharing close quarters in a nest.